This is a male Drosophila melanogaster imaged from the side. Credit: André Karwath aka Aka. The motif ten element (MTE) is a downstream core promoter element. Although it is harder to regulate the transcription of genes with multiple transcription start sites, "variations in the expression of a constitutive gene would be minimized by the use of multiple start sites." Earlier "studies led to the design of a super core promoter (SCP) that contains a TATA, Inr, MTE, and DPE in a single promoter (Juven-Gershon et al., 2006b). The SCP is the strongest core promoter observed in vitro and in cultured cells and yields high levels of transcription in conjunction with transcriptional enhancers. These findings indicate that gene expression levels can be modulated via the core promoter." "[T]he human sterol C5 desaturase-like (SC5DL; also known as SC5D[, GeneID: 6309]) promoter (Nishi et al. 2000; Sugawara et al. 2001) has sequences with similarity to the Drosophila Inr and MTE ... but not to the DPE." "[B]y using the JDSA search program (http://www-biology.ucsd.edu/labs/kadonaga/JDSA.html), ... the Drosophila genome database [can be surveyed] for sequences (which are upstream of an open reading frame) that contain a motif 10 consensus from +18 to +29 relative to A+1 of a consensus Inr sequence." "About 75% of known human disease genes have a recognizable match in the genome of fruit flies, and 50% of fly protein sequences have mammalian homologs." "Drosophila is being used as a genetic model for several human diseases including the neurodegenerative disorders Parkinson's, Huntington's, spinocerebellar ataxia and Alzheimer's disease. The fly is also being used to study mechanisms underlying [free radical theory] aging and oxidative stress, immunity], diabetes, and cancer, as well as drug abuse." "From a teleological standpoint, this arrangement [of focused promoters] is consistent with the notion that it would be easier to regulate the transcription of a gene with a single transcription start site than one with multiple start sites." "The MTE in the Drosophila Tollo core promoter is recognized by human basal transcription factors. ... The MTE exhibits synergy with the TATA-box as well as weak activity in the absence of the TATA and DPE motifs with human transcription factors." "In focused transcription, there is either a single major transcription start site or several start sites within a narrow region of several nucleotides. Focused transcription is the predominant mode of transcription in simpler organisms." "Focused transcription initiation occurs in all organisms, and appears to be the predominant or exclusive mode of transcription in simpler organisms." "In vertebrates, focused transcription tends to be associated with regulated promoters". "The analysis of focused core promoters has led to the discovery of sequence motifs such as the TATA box, BREu (upstream TFIIBrecognition element), Inr (initiator), MTE (motif ten element), DPE (downstream promoter element), DCE (downstream core element), and XCPE1 (Xcore promoter element 1) [...]." "In dispersed transcription, there are several weak transcription start sites over a broad region of about 50 to 100 nucleotides. Dispersed transcription is the most common mode of transcription in vertebrates. For instance, dispersed transcription is observed in about two-thirds of human genes." In vertebrates, "dispersed transcription is typically observed in constitutive promoters in CpG islands." "Focused transcription typically initiates within the Inr, and the A nucleotide in the Inr consensus is usually designed as the “+ 1” position, whether or not transcription actually initiates at that particular nucleotide. This convention is useful because other core promoter motifs, such as the MTE and DPE, function with the Inr in a manner that exhibits a strict spacing dependence with the Inr consensus sequence (and hence, the A + 1 nucleotide) rather than the actual transcription start site (Burke and Kadonaga, 1997, Kutach and Kadonaga, 2000 and Lim et al., 2004)." Def. one "of the simplest or essential parts or principles of which anything consists, or upon which the constitution or fundamental powers of anything are based" is called an element. The motif ten element (MTE) "promotes transcription by RNA polymerase II when it is located precisely at positions +18 to +27 relative to A+1 in the initiator (Inr) element." "The MTE (motif ten element) was found to be a functionally active core promoter element that corresponds to an overrepresented sequence (termed motif 10) that was identified in Drosophila core promoter regions ( Ohler et al., 2002 and Lim et al., 2004). The MTE is located immediately upstream of the DPE at precisely + 18 to + 27 relative to the A + 1 in the Inr and is conserved from Drosophila to humans. DNase I footprinting analyses suggest that the MTE, like the DPE, is a recognition site for TFIID. The MTE functions cooperatively with the Inr but can act independently of the DPE as well as the TATA box. There is, however, synergy between the MTE and DPE as well as between the MTE and TATA box." The motif ten element is not used to transcribe A1BG. ↑ 1.0 1.1 1.2 1.3 1.4 Chin Yan Lim, Buyung Santoso, Thomas Boulay, Emily Dong, Uwe Ohler, and James T. Kadonaga (July 1, 2004). "The MTE, a new core promoter element for transcription by RNA polymerase II". Genes & Development 18 (13): 1606-17. doi:10.1101/gad.1193404. PMID 15231738. http://genesdev.cshlp.org/content/18/13/1606.full. Retrieved 2013-02-10. ↑ 2.00 2.01 2.02 2.03 2.04 2.05 2.06 2.07 2.08 2.09 2.10 Tamar Juven-Gershon and James T. Kadonaga (15 March 2010). "Regulation of gene expression via the core promoter and the basal transcriptional machinery". Developmental Biology 339 (2): 225-9. doi:10.1016/j.ydbio.2009.08.009. http://www.sciencedirect.com/science/article/pii/S0012160609011166. Retrieved 2016-01-16. ↑ HGNC (February 5, 2013). "SC5DL sterol-C5-desaturase (ERG3 delta-5-desaturase homolog, S. cerevisiae)-like [ Homo sapiens ]". 8600 Rockville Pike, Bethesda MD, 20894 USA: National Center for Biotechnology Information, U.S. National Library of Medicine. Retrieved 2013-02-10. ↑ LT Reiter, L Potocki, S Chien, M Gribskov, E Bier (2001). "A Systematic Analysis of Human Disease-Associated Gene Sequences In Drosophila melanogaster". Genome Research 11 (6): 1114–25. doi:10.1101/gr.169101. PMID 11381037. PMC 311089. //www.ncbi.nlm.nih.gov/pmc/articles/PMC311089/. 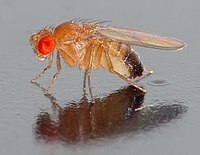 ↑ 5.0 5.1 "Drosophila melanogaster, In: Wikipedia". San Francisco, California: Wikimedia Foundation, Inc. February 10, 2013. Retrieved 2013-02-10. ↑ "element, In: Wiktionary". San Francisco, California: Wikimedia Foundation, Inc. 7 January 2016. Retrieved 2016-01-16. Bier lab (2008). "Homophila: Human disease to Drosophila disease database". University of California, San Diego. Retrieved August 11, 2009. An online database available to search for human disease gene homologues in flies and vice versa. Chin Yan Lim, Buyung Santoso, Thomas Boulay, Emily Dong, Uwe Ohler, and James T. Kadonaga (July 1, 2004). "The MTE, a new core promoter element for transcription by RNA polymerase II". Genes & Development 18 (13): 1606-17. doi:10.1101/gad.1193404. PMID 15231738. http://genesdev.cshlp.org/content/18/13/1606.full. Retrieved 2013-02-10. This page was last edited on 7 April 2018, at 03:42.